"Mmm, there's nothing better than tetracycline in the morning." One of the most short-sighted and objectionable practices of factory farms (sadly, there are so many to choose from) is the massive use of antibiotics on healthy animals in an effort to stave off illness that might prevent getting them to the slaughter. And when I say massive, I mean massive. US factory farms pour some 30 million pounds of antibiotics into their animals every year (in contrast, humans consume just a few million pounds). That’s a lot of antibiotics, and it is a practice that helps boost the profit margins of both Big Agriculture and Big Pharma. There’s a problem, though. A big one. Using such outsize quantities of antibiotics helps breed antibiotic resistant bacteria. And those hardy little bacteria kill lots of people every year. The FDA has been aware of the resistance problem for many years. In 1977, it decided to act on scientific evidence and order farmers to stop using penicillin and tetracycline in farm animals. The law required the agency to act immediately. 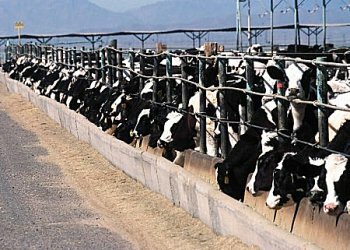 But under pressure from Big Ag and Big Pharma (80 percent of all antibiotics sold in the United States are fed to healthy animals), the agency dragged its feet and did nothing, even though public health and environmental organizations, including the American Medical Association(PDF), urged it to act. With scientific appeals falling on deaf ears for decades, the Natural Resource Defense Council, joined by other plaintiffs, filed a lawsuit last spring seeking to make the FDA follow its own rules. In a calculated attempt to undermine the legal basis for the NRDC suit, the FDA’s recent reversal simply nullified the original 1977 order, in effect wiping out 35 years of history and scientific research. So there you have it: your (totally corrupted) government at work. Your smart policy response? Stop eating factory-farmed meat. Even better, stop eating all meat. Thank your for this article. Do you have information about antibiotic use in Canadian farms? I hope my country has followed the European method. Though I support restrictions on antibiotic use in animals for growth promotion, at least for types of antibiotics used in humans, I am unaware of any data suggesting that restricting animal use in Denmark for instance has resulted in lower resistance rates among human pathogens. Clearly one would expect a large impact upon human pathogen resistance (and indeed human mortality) if the link to resistant pathogens in animals is a strong as you imply. This speaks to what I believe is a much more important issue for human pathogen resistance, which is the overuse of antibiotics in humans. I agree that regulation is the most sensible method of restricting antibiotic overuse in all species. It is not clear to me that such regulation would reduce your opposition to modern methods of high density animal production, however. thank you, @marthastewart for lending your voice to the voiceless. end #factoryfarming | living in a modern world.